When Brandon and I decided to start Furrow Horse Farm last January, we knew we were about to spend a lot of money. 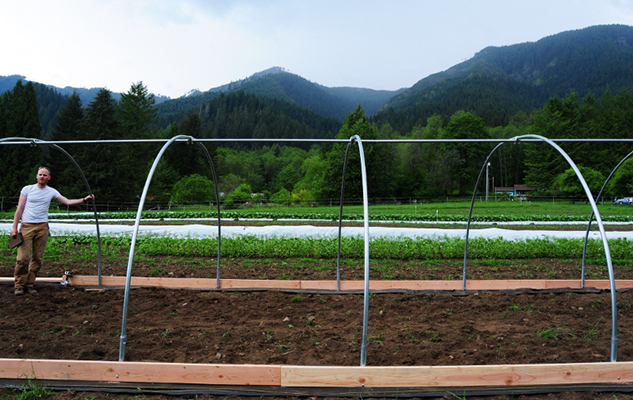 We were moving onto leased land that had no infrastructure, and we needed to build hoop houses and put up a deer fence. Since we had both been working for other farmers in the years after graduating from college, we didn’t have very much money saved, nor did we have inheritances or farmland in our families. We didn’t have so much as a wheelbarrow or a hoe. 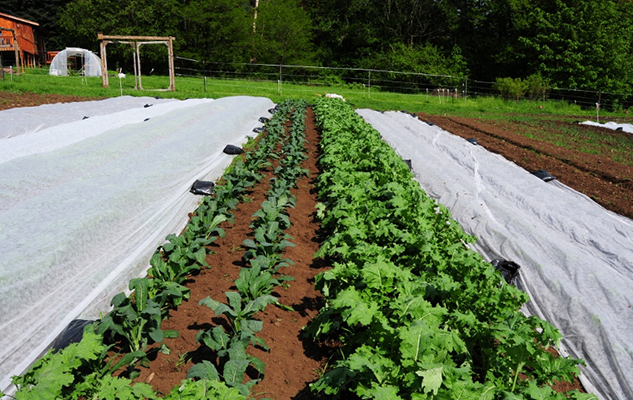 So how could we raise the roughly $10,000 we knew we needed to successfully start our farm? We began by asking our family members for small loans. Most turned us down, as they did not view farming as a real business venture and did not think we could actually make any money growing vegetables. My parents, however, believed in us and have supported us all along, and they were willing to loan us money for tools and equipment. Next, we applied for a Kiva Zip loan through the Greenhorns, and were approved. 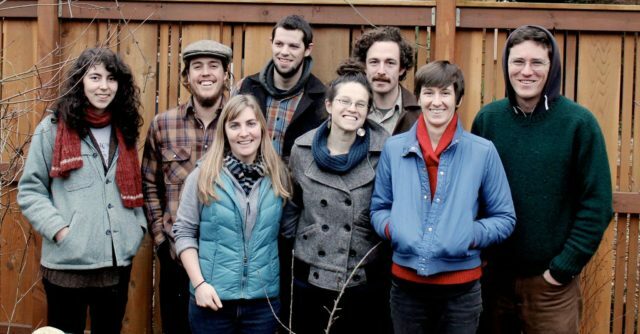 Kiva Zip Loans are crowd-funded, but the lenders are paid back every cent. And as borrowers we are charged 0% interest. Within 24 hours of posting our Kiva Zip Loan ask on social media, we were fully funded. We began making our repayments in August, and will be totally paid off within two years. At that point we will be eligible for a larger Kiva Loan if we choose to do another. Finally, at the last minute, I applied for a grant through a private philanthropic organization based in Seattle that is dedicated to helping sustainable farmers in Washington, especially those with financial need. In my grant application, I wrote about our dream of farming with draft horses and reducing our use of fossil fuels on the farm. One month later, we heard back—we had been chosen for the grant! It was a total game-changer, and the only reason we were able to purchase draft equipment and our team of draft horses this year. Even better, we don’t have to pay the money back! All in all, it has cost us around $15,000 to get our farm started. For draft horse equipment and our team of horses, we spent another $15,000. When I write it down, it feels like A LOT of money. Which it is. However, I believe we have set ourselves up to be even more successful in our second season and have much lower expenses. And the most important capital this season was our friends and family and all of the help they provided. We could not have done it without them! As far as capital for the future, the real barrier we are feeling is access to capital for land. Micro-loans and small loans for equipment feel less daunting at this point, but when we think ahead to the dream of owning our own farm, we just can’t work our heads around how to make it happen. Brandon and I both have off-farm jobs throughout the year, which we will continue to do until the farm makes enough to support us. This might help when applying for land loans, but unfortunately we live in a rural area where well-paid jobs are few and far between. This conundrum led to my decision this fall to begin a masters program in sustainable food systems, with the hope that it will help me get better paid off-farm jobs in the future. It is scary and a gamble, as there is no guarantee it will actually help, and now I am adding to the student loan debt I already have from my undergraduate degree. It is amazing to me how easy it is to get a federal loan for school, while at the same time it is so difficult to qualify for federal assistance to buy farmland. Until our government realizes the importance of getting young farmers onto land and helping them build successful businesses, it will remain almost impossible for young and beginning farmers to own farmland.